CSCI has a long history of collaborations in clinical neuroscience with neuroimaging research focused on the neurological impacts of substance abuse and neurodegenerative diseases, such as traumatic brain injury (TBI) and mild cognitive impairment (MCI), and Alzheimer's disease (AD). Our most recent NIH-funded collaboration (R01AG054049), with Co-PI Dr. Mark Bondi in Psychiatry, is utilizing our QUEST-NI analysis and visualization methods to evaluate newly developed diagnostic and MRI metrics for measuring changes in an area of the brain where the first visible pathologic changes resulting from the onset of AD are believed to occur. This new approach has the potential to improve diagnostic and imaging precision in Preclinical AD and impact the prospective design of future studies, as well as promote new biomarker assessment modalities and fundamental shifts in therapeutic targets for AD. Krysl P, Bondi MW, Ward S, Frank LR. On sources of error in finite element simulation of blast effects in the human brain. Journal of Computational Nonlinear Dynamics 7: 031008, 2012. Sorg SF, Delano-Wood L, Luc N, Schiehser DM, Hanson KL, Nation, DA, Lanni E, Jak AJ, Lu K, Meloy MJ, Frank LR, Lohr JB, Bondi MW. White matter integrity in veterans with mild traumatic brain injury: Associations with executive function and loss of consciousness. Journal of Head Trauma Rehabilitation 29: 21-32, 2014. Sorg SF, Schiehser DM, Bondi MW, Luc N, Clark AL, Jacobson MW, Frank LR, Delano-Wood L. White matter microstructural compromise is associated with cognition but not posttraumatic stress disorder symptoms in military veterans with traumatic brain injury. Journal of Head Trauma Rehabilitation 31: 297-308, 2016. Delano-Wood L, Stricker NH, Sorg SF, Nation DA, Jak AJ, Woods SP, Libon DJ, Delis DC, Frank LR, Bondi MW. Posterior cingulum white matter disruption and its associations with verbal memory and stroke risk in mild cognitive impairment. Journal of Alzheimers Disease 29: 589–603, 2012. Working in conjunction with Dr Benjamin Zahneisen at Stanford University, we have developed a highly efficient multi band pulse sequence capable of acquiring multiple types of diffusion weighted (DW) MRI data, including high angular resolution single pulsed field gradient (sPFG) data, double pulsed field gradient (dPFG), and hyperecho sPFG. The pulse sequence is based on the highly efficient and robust Extended Hybrid-Space SENSE for EPI which provides highly efficient off-resonance and eddy current correction using a joint interleaved blip-up/down reconstruction. This acquisition is significantly faster than the standard acquisition that require two (blip up & blip down) acquisitions, and also significantly enhances image quality as the distortions are corrected as part of the reconstruction process, rather than ex post facto. The resulting acquisition is not only significantly more time efficient, but shows a dramatic improvement in DWI image quality. This pulse sequence is currently being used in a range of basic and clinical research projects. Figure 1, on the right, shows FA maps (left) and directionally colored FA maps (right) from old (top) and new (bottom) pulse sequences. Marked improvement is evident. High resolution, low distortion DTI remains one of the major challenges in MR pulse sequence development. In order to reduce the deleterious effects of the significant physiological motion in the human brain, single shot, slice selective (i.e., 2D) EPI has been widely adopted as the standard imaging sequence for human in vivo diffusion MRI. However, this limits the attainable spatial resolution, and is prone to susceptibility artifacts that significantly distort the images. 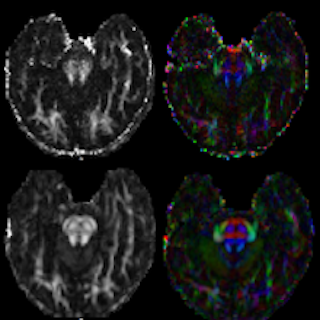 In an earlier NIH-funded project (R01 MH064729), we developed methods for high spatial and angular resolution diffusion tensor imaging (DTI) in humans that overcomes these limitations in existing methods. We developed a novel high resolution, low distortion 3D Variable Density Spiral (VDS) Fast Spin Echo (FSE) diffusion tensor imaging (DTI) pulse sequence that allows higher spatial and angular resolution DTI and is able to image in regions of the human brain previously unattainable due to susceptibility distortions. Frank LR, Jung Y, Inati S, Tyszka JM, Wong EC. High efficiency, low distortion, 3D diffusion tensor imaging with variable density spiral fast spin echoes (3D DW VDS RARE). Neuroimage, 49: 1510-23, 2010. Tyszka JM, Frank LR. High-field diffusion MR histology: Image-based correction of eddy current ghosts in diffusion-weighted rapid acquisition with relaxation enhancement (DW-RARE). Magn Reson Med, 61: 728-33, 2009.